Holy Cow, the Democratic Party will never accept the 2016 election. The DNC on Friday filed a multimillion-dollar lawsuit Friday against the Russian government, the Trump campaign and the WikiLeaks claiming they conspired to disrupt the 2016 election skew tilt the election to Donald Trump. Let’s be real. This suit is one more example of the Democratic Party unable to accept the fact that Donald Trump beat their golden girl, crooked Hillary Clinton. The people named in the suit include Donald Trump Jr., his son-in-law Jared Kushner, former campaign chief Paul Manafort and campaign officials Richard Gates, the guy who supposedly started it all, George Papadopoulos, Trump friend Roger Stone, the Russian Federation, the Russian armed forces, Guccifer 2.0., Wikileaks and its leader Julian Assange, and 10 unidentified people. The DNC lawsuit claims that the cyber attack undermined its ability to communicate with voters, collect donations and operate effectively. Actually, it was the lousy candidate they selected that undermined its ability to communicate with voters, collect donations and operate effectively. The truth is that with all the investigations on the matter, there is not a scintilla of proof that President Trump or his campaign colluded with the Russians. And as far as suing the Russians, good luck with getting them to even recognize the suit. This is not a lawsuit, it’s the political equivalent of a 12-year-old losing a game and crying that the victors cheated. 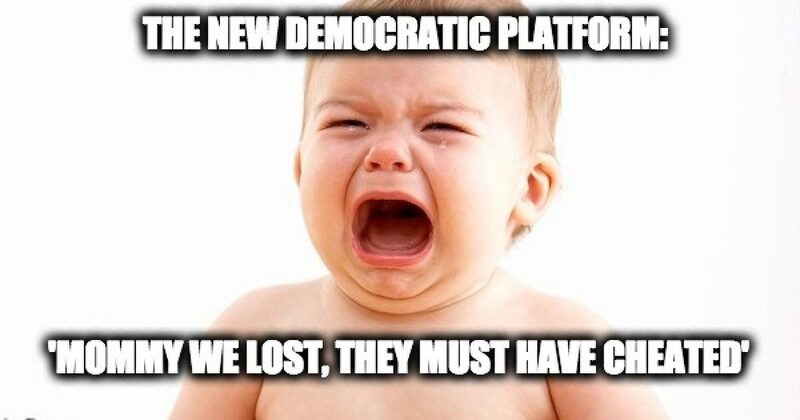 That my friends is the new Democratic Party platform.